A challenge that I have noticed in marketing departments of late is the widening gulf between data analytics teams and marketing planning teams. While there is a healthy respect between these disciplines, there seems to be a disconnect in terms of how to effectively they work together. Data Analysts are not entirely comfortable exploring how data can be used creatively to fuel new marketing activities. Marketing Planners are not yet used to spending time considering how their initiatives can generate new actionable data. This schism is a significant issue for organizations that are shifting more marketing dollars to digital tactics enabled by data-driven tools and techniques. To help bridge this gap, I created an IFTT (‘if this then that’) worksheet that illustrates the relationship between audience data and marketing initiatives. I recently used this in a training session with a marketing department where participants explored how data can unlock new marketing initiatives, and how marketing initiatives can in turn unlock new audience data. In the training session, participants spent time working in groups to drill-down 5-levels deep (similar to the 5-Whys). It was an interesting way to get people in different roles within a marketing department to explore the relationship between data and marketing. Below is a completed worksheet from the session. Hopefully it can help you literally and figuratively get data and marketing on the same page. There have been many times throughout my career when I have struggled to find that right, next question to ask a client when they are briefing me on a new assignment. These awkward pauses typically happen when I am trying to balance the need to understand the upstream ‘problem to be solved’ with the need to be clear on downstream executional details. It can feel like I am piloting a plane that is flying haphazardly between higher and lower altitudes. One way that I have learned to take control and smooth out these early discussions is to visualize the information that I need to do my work. Below is a framework that I often have running in my mind during these meetings where I am intaking a new assignment. It helps me to better organize the conversation and visualize the information that I need to take away. Hopefully it provides you with a place to start and way to avoid a crash landing. The Problem with Dropping the "D-word"
Marketing pundits have been calling for the industry to drop the word “digital” since consultancies announced that businesses were entering the “post-digital” era a decade ago. The argument has picked up steam lately with the help of wonderfully profane columns from Mark Riston and new WPP boss Mark Read banning the use of the word. There are a number of reasons I agree with this, in theory. Using the word creates siloes that work against integration, and focusing on digital in isolation means focusing on tactics and channels before strategy. Plus, classifying what is digital is now virtually impossible, as “traditional” content is now delivered digitally. But in practice, I see a number of challenges with organizations simply dropping the word. To be useful, a word needs to be distinct, meaningful, and commonly understood. In 2019, “digital” is none of these things. It covers a wide variety of topics that are relevant for businesses today. When we avoid using it, we risk not focusing on some of the important underlying topics that have become so intertwined with it. Removing “digital” from job titles has been in vogue for some time. After years of growing internal teams capable of building and managing websites, apps, social media, and email marketing programs, the trend is to now move these people within broader and more integrated marketing departments. The risk is that when we dissolve digital leadership within marketing departments, everyone and no one is responsible for understanding how new technologies can better serve business goals. Marketing technology is more sophisticated, technology investment is increasing and its strategic use is widely regarded as a competitive advantage. Who is on point to make these calls? If you drop the D-word from your org chart, make sure that you remain clear on who is responsible for leading marketing technology decisions. Digital strategy initiatives are typically business initiatives that involve some combination of data, technology, online commerce and user experience. The umbrella term “digital” is often used to package these elements together in some way to create a project brief, and indicate that a certain type of “digital thinking” is required to solve it. Solving these types of initiatives requires a mix of skills and approaches that are typically rooted in service-design, data science, and product development. While removing the D-word from describing strategic initiatives can help marketers focus more clearly on core business issues, it can also lead them to staff these projects without the appropriate mix of upstream thinkers. Who is exploring the strategic use of different sources of data, payment models, or online communities before “digital” tactical decisions are made? If you drop the D-word from strategy initiatives, make sure that your teams are capable of fully exploring the business opportunities that technology and the networked economy enable. Removing the word “digital” from planning can help teams focus on creating campaigns that achieve a goal versus a particular media mix. This can theoretically help marketers avoid the issue of over-investing in shiny new digital tools at the expense of more established media. In practice, I have seen many marketers and creative agencies struggle in this area. While all businesses intend to move forward by dropping a distracting focus on digital, many regress. Marketers and creative teams biased towards traditional approaches of crafting messages are freer to use technology and digital media strictly as a communication medium. Explorations of how they can be used beyond a canvas are no longer top of mind. Some teams have moved past this, and naturally consider how technology can help inform a marketing concept, in addition to its execution. If you drop the D-word from marketing planning, make sure your team is one of them. In the end, my issue with dropping the D-word is less about language than it is about the assumptions that we are making as an industry in dropping it. It assumes that our teams are all uniformly fluent in the capabilities of marketing technology. It also assumes that by explicitly not focusing on digital, the underlying elements connected with the word – user experience, data science, online services, networked communities – will blossom without this distinction. In 2019, these assumptions are critical. Are you ready to drop the D-word? I am pleased to report that after I conquered my normal pre-class combination of impostor syndrome, fear of laptop failure, and over-caffeination that the Modern Marketing Brief training session was a success. We had a smart and engaged group of marketers in the session that focused on how briefs (and briefings) need to evolve to become more impactful. There was plenty of rich discussion and super-useful perspectives shared among the class. I think I scribbled down the most notes of anyone in the room. Over the course of the morning, we covered the role of the brief and the qualities of a strong briefing (which have not changed). We then explored the nature of modern marketing programs and marketing processes (which have changed). The bulk of our time focused on 10 key changes that marketers can adopt to make their briefs (and briefings) more relevant and valuable for 2019 and beyond – with plenty of examples and applied group learning. After I pack-up at the end of every training session, I take a deep breath and review the participant evaluations. I was really pleased to see that participants found this brand-new training session valuable - 100% would recommend to a friend - and I received some great tips on how to tweak the curriculum (all of my participant evaluations are posted online and unfiltered here). I look forward to running the Modern Marketing Briefs course again in 2019, hopefully this time with a few less pre-class jitters. To prepare for my new Modern Marketing Briefing course, I sent out an informal survey to my network asking for marketer’s perspectives on their current briefs (and briefings). The purpose of the survey was to help me refine and validate some of my course material – and see if I had any blind spots. Overall, 32 people provide responded from agency-side and client-side marketing organizations. While not statistically significant, I found the results and comments quite insightful. I thought they might be of interest to others, so I have posted the key findings and takeaways below. If you would like a copy of the full results you can download it here. Thanks again to everyone who participated in the survey, and I hope to see a few of you at the Modern Marketing Briefing course next month! Completing Briefs: The sections of the brief that respondents feel are completed least effectively are a measurable goal(s) followed by a single-minded proposition. Briefing Attendance: Many respondents indicated that technology representatives and ‘final approvers’ are not consistently present at briefing meetings. Lessons Learned: Respondents from agencies and brands indicated that lessons from prior marketing campaigns are not regularly shared in briefs and during briefings. Digital Projects: Technology representatives appear more involved for client-side projects, and both groups reported that they often brief digital projects differently. Briefing Information: Many agency-side respondents indicated that they are not receiving enough information from clients in the brief and during the briefing process. Integrated Briefs: Respondents from agencies and brands indicated that some projects continue to be briefed separately, where others are briefed in an integrated manner. Overall Effectiveness: On average, respondents were fairly neutral on the effectiveness of their briefs and slightly more negative on the effectiveness of their briefings. Not enough time spent upfront to define and align to measurable business goals. Teams often do not invest enough time in preparing a clear and effective brief. Briefings can feel disorganized, and people often do not show up and/or tune-out. Budgets often are not realistic given expectations, and are not clearly allocated. Digital and social is often included in as simply a ‘box to tick’ within marketing briefs. Lack of insight around the customer, particularly relating to the customer journey. Briefings often have way too many people involved, and politics can be disruptive. Make sure that your marketing team understands the underlying business drivers for change and why the status quo is not viable. These drivers should relate to changes in customer behaviour, competitive actions, or other significant business realities – not marketing trends. Communicate these in a clear, specific, and relatable way. For example, illustrate how your customers have traditionally engaged with your business / brand and how they do so now – dramatizing the gap to be closed. Invest the time upfront to identify and quantify the outcomes that any changes to your marketing department need to produce to be successful. These outcomes should be used to drive all of your decisions around changes to people, processes, and tools. Communicate these outcomes openly throughout the organization, with performance targets to hold the program accountable. For example, one of my clients stated an innovation goal of “15% of our marketing budget will be used on tactics we have never tried before”. Be specific—stating the goal of “Becoming More Digital” is not good enough. Marketing leaders who are modernizing their departments need the support of their executive teams, and members of the marketing department need to see evidence of this support. For example, I have found that having an Executive Sponsor introduce and conclude an in-house training program to be a simple and effective way to demonstrate this. It provides the program with greater credibility, and it allows the marketing department to understand how changes in marketing are required to support what the larger organization is driving towards. If your marketing department is modernizing, what does modern marketing actually look like for your business or brand? While you may have goals for your overall modernization program and performance targets for your campaigns, it is helpful to have a shared understanding of how your marketing programs should generally look going forward (and how that is different from today). More content? More direct? More testing? One exercise that I have found helpful in workshops is a Show & Tell—encourage marketers to share out-of-category examples that inspire them. Make time to discuss what can be applied to your future marketing programs, and keep the conversation going. If you are asking members of your marketing department to change what they do and how they do it, make sure you do your homework. Everyone will be processing these changes through their own personal prism of ‘what does this mean for me?’ You owe everyone clear and specific answers to how these changes will affect and benefit them (including becoming more marketable outside of your organization). Invest the time in working through revised job descriptions, process flows, RASCI charts, and other necessary documentation. Make it personal. The surest way for a marketing modernization program to fail is to not invest in external training and support for the people actually changing what they do and how they work. It is like telling a plant to grow without providing water or sunlight. Bring in the right mix of subject matter experts to partner with. Demonstrate your commitment by openly sharing the investment that your organization is spending (time and money) to ensure that the change is successful. Work with HR to make successful completion of training mandatory. Marketing departments are modernizing in part by embracing agile principles like prioritizing frequent face-to-face communication across multiple disciplines. This runs counter to traditional waterfall processes that connect separate departments. Training can help address this challenge by focusing on those moments in your new process where things will most likely break down. Design group exercises and create job transfer tools that demonstrate these new patterns of behaviour. Symbols also work. For example, a client that leads Digital within a large agency recently gave up his office and works in different physical places throughout the building every day to demonstrate the importance of fluid collaboration. A pillar of any change management program is communication. People not only need to understand why and how things are changing, but also need to be heard. This can be done formally through workshops, message boards, and other feedback loops. In digital training, my clients often like to sit in to see who appears particularly engaged and where support lies (and does not). This can give some insight into where barriers for adoption may exist, and who might be enlisted as ‘informal leaders’ in driving change across the department once training is complete. Humility goes a long way when modernizing a marketing department. You may (and should!) start with clear goals and a detailed plan but some things will not work and other things will be missed. Let people know that this your expectation upfront, and that they are expected to play an important role in identifying where and how adjustments can be made. From a marketing standpoint, this is where Beta Projects can play a valuable role – to test-drive your hypotheses and socialize learnings. When done well, these Beta Projects can be woven into training programs as group exercises and – even better – demonstrate quick wins for team. While marketing modernizations programs may take place over a fixed period of time, it is important that they are viewed in the context of how an organization continues to evolve. Ensure that steps are in place to regularly measure and learn from the impact of the program. Look ahead and schedule training tune-ups and feedback loops to check-in. Lee Valley has been so successful because it does not look at modernization as a project, but a journey that everyone is on together. 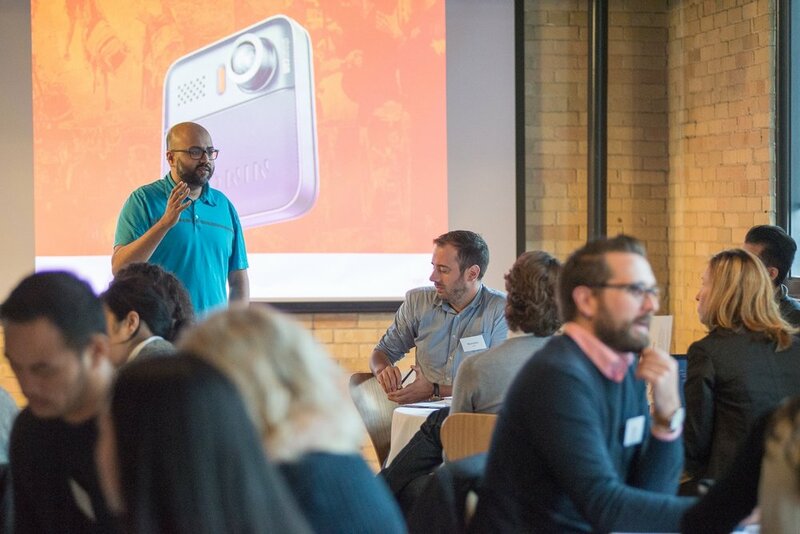 Last week, we hosted our sixth Digital Marketing Strategy Bootcamp in Toronto. It was another sold-out session (thank you!) attended by a fantastic group of marketers. For a sunny Friday afternoon, the participants brought an impressive amount of energy to the class and we had a lot of fun (post-session participant surveys are posted online and unfiltered here). One of the most challenging parts of designing the Bootcamp is ensuring that it is relevant for all participants. We typically have folks attending from a variety of industries, company sizes, departments, and backgrounds. How can one class be relevant for everyone? I try to address this challenge by focusing on strategic principles and frameworks that do not change even when the digital landscape inevitably does. The principles and frameworks are applied through a set of group activities that are based on ‘analogous’ problems that all marketers face – even if that is not obvious at first. Analogous thinking refers to using information from one domain to help solve a problem in another domain. I use this approach in my own strategic consulting work, and try to infuse it into the Bootcamp exercises as well. The exercises incorporate different brands, personas, and goals that are not seemingly connected to where any participants work – but are focused on problems that all participants face. The other benefit of having a group of smart marketers work on problems outside of their own fields is inviting a guest client to provide ‘real-world briefs’ to solve. This time, we were extremely fortunate to have the awesome Michael Oliver from BMW as our guest. Michael brought in a range of different briefs that, while relating to BMW, focused on core problems that all marketers must address. When groups shared their thinking with Michael, it was amazing to hear the novelty of ideas coming back. Participants drew on their own experiences outside of the automotive category to solve briefs for BMW in new ways. It was a great exercise – a true win-win. Outside of the Bootcamp, I think all marketers can benefit from embracing more analogous thinking. Reframe some of the problems that you are facing by stripping out the domain-specific details. Write up a problem statement that can more easily relate to other industries or companies. Explore how others outside of your conventional field of view are approaching this problem. Collaborate with others outside of your industry for fresh thinking that you can bring back and apply. Take time to cleanse your marketing palate. Thanks again to everyone who attended the Bootcamp and to Michael for his involvement. I feel reenergized after spending time with all of you! One of the things that I am preparing for my upcoming Digital Marketing Strategy Bootcamp is a reference guide filled with handy strategy frameworks. Some of the frameworks are very well-known (i.e. created by someone else), others much less so (i.e. created by me). Either way, my hope is that this reference guide will be useful for participants in a way that a binder full of slides can not be. A well-known framework that will be included in this reference guide is a competitive positioning map. This type of tool is used to visualize differences among competing organizations and brands across various dimensions. These maps are often used in brand strategy work and can be presented as spider graphs, comparison tables, and scatter charts. The format used most often is a matrix that illustrates competitive differences against two axes. An additional layer of performance data (e.g. revenue or market share) is often included in the matrix in the form of different ‘bubble’ sizes. A few years ago, I was working with some friends to help refine the positioning for an advertising agency (the irony being that the last thing an advertising agency wants to position itself as is an advertising agency). To do so, we created a competitive positioning matrix and analyzed 100 different agencies. This led us to identifying 20 different ‘positions’ in the market. This competitive positioning map was helpful for us to understand how various agencies tended to focus on a few key areas. Established agencies becoming more digital. Digital agencies becoming more integrated. Consultancies becoming more creative. Creative agencies becoming more strategic. Out with technology, CRM, advertising. In with experiences, product, engagement. I could go on, but will save that for another post. My point is that by taking the time to structure a matrix based on meaningful dimensions and completing the analysis with a robust group of competitors can be a useful exercise for the present and the future. P.S. If you are interested in agency positioning, I highly recommend following Tim Williams who literally wrote the book on the topic. His writing was immensely helpful for this work. Over the years I have taken a number of different writing courses. One that I particularly enjoyed was a screenwriting class at Ryerson. We learned the basics of developing strong characters, creating dramatic scenes, and structuring entertaining story arcs. It was fascinating to deconstruct famous movies into their component parts. While my Hollywood career has yet to take off, the lessons I learned in that screenwriting class have served me surprisingly well in my marketing career – particularly when creating Customer Scenarios. 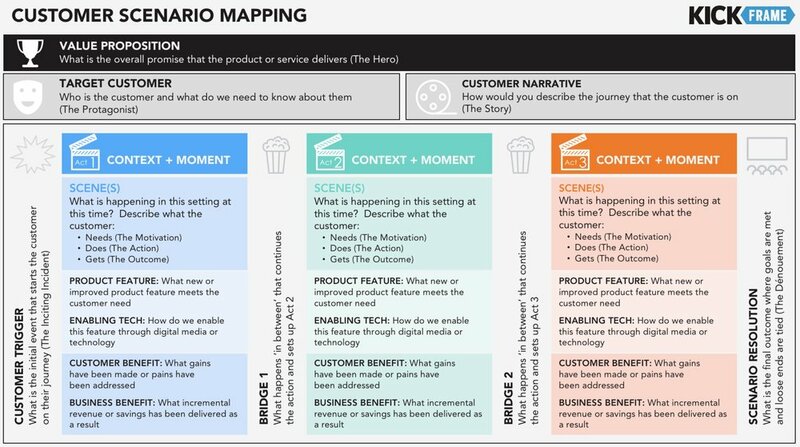 Customer Scenarios are used to describe how a new product, service, or feature will work through a fictional story about the person experiencing it. The Scenario typically takes place in the future, and brings to life the benefits of a new functional idea in a compelling and concrete way. Customer Scenarios are different than User Stories (documenting requirements) and Customer Journeys (visualizing moments & phases) in that they are most often used to sell a vision to a group. That is why they are commonly included as part of concept presentations and new businesses pitches. My role in creating Scenarios has largely been creating the scripts (a point strictly and lovingly enforced by the Creative Directors I have worked with). Strategic ‘stick to the script’ Planners draft Scenarios that align product vision, supporting features, customer insight, and business value into compelling and realistic narratives. Below is a framework that I have used to help with strategic alignment. Hopefully it helps you in your own work. After all, there is no phrase more powerful than ‘let me tell you a story’. Do We Need A More Digital Brief? I have heard some version of this question asked many times over the last decade. It usually happens when a senior client-side marketer feels that their campaigns are “too traditional” or when an agency president feels that their people “don’t get digital”. The first moment typically leads to the second. In an effort to address this crisis of digital confidence, the conversation then leads to changing the brief – the document that has changed the least over the last 50 years. “If we make the brief more digital then the work will follow. Right?” This is when a Planner transforms into a live boardroom version of Munch’s The Scream. “The brief is about the idea, not the execution! The brief needs to be media-agnostic! The brief is about the problem, not the solution! What is digital when everything is digital? The brief needs to stay brief, adding a new field will MAKE IT TWO PAGES!” And so, it goes. I get it. There are many good reasons why the brief has more or less remained the same. It is a critical document that bridges strategic thinking to creative execution. The brief also needs to be fit for purpose, and that purpose is not always creating conceptual ideas only. Many times, the purpose of a briefing document is to provide some executional direction for teams. In these cases, I have found that there are a few tweaks that can be made to document (the brief) and how the document is used (the briefing) that can lead to stronger and more creative digital marketing solutions. People in digital roles are typically involved after a brief has been written, to vet or cost a technical solution (and this usually happens far too late). Digital SMEs can provide valuable strategic input prior to digital tactics being identified. They are closest to customer data, technology trends, and Internet culture. Collaborating with your digital folks early on can sharpen your customer and marketplace insights. Including digital folks upstream can also help build internal relationships that help when projects get thorny in development. The beating heart of most briefs is the key message – what needs to be communicated. Briefs often include more direction on how we want to change customer perception than how we want to change customer behaviour (beyond driving sales). It is critical to understand what exactly we want customers to do when identifying the right mix of digital tactics. Do we want to drive social sharing, conversions on a website, search volume? The more specific that briefs can be about behavioural goals—often proxies or contributors to financial goals—the more focused digital marketing can be. Understanding the social landscape is not only relevant for informing social media-focused campaigns but can also provide valuable insight into how people think and feel about a particular topic. What are people talking about? What do people find valuable? What do the community norms tell us about how this group interacts with each other? Search volume and competitive search bidding can also provide useful clues into the ebbs and flows of customer interest. Including a few of these data points can help shape the description of the marketplace in your brief and can provide inspiration for downstream content ideas. Incorporating aspects of user experience design into briefs can lead to fresh digital creative work. By highlighting what a customer is thinking, feeling, and doing at key moments helps teams to build empathy and explore more service-based ideas. For example, if the brief includes common customer friction points, teams can identify new areas of content or online self-services to help resolve. Highlighting the mindset of a customer can lead to new media ideas that align with context / emotional state. As UX Designers are becoming more involved in strategic discussions, including this type of input in a brief can help them to orient themselves and contribute quickly. While Account Planning tells us that briefs should be about the idea and not about the execution, I have yet to work with a creative team that does not appreciate some direction on digital media and technology. Getting Digital SMEs to provide an early perspective on what seems to fit helps - especially if the brand/ organization has deep technology capabilities and a number of owned digital properties. Make sure to present this input as a starting point and not a prescription. Allowing for smaller tactical briefs ensures campaign briefs do not need to be ‘catch-alls’. These smaller briefs can be focused on specific tactical projects (i.e. new website section, a new customer acquisition campaign, a new triggered email) and do so in a way that ladders up to the larger brand brief. Having these smaller briefs can provide more specific insight and direction for what needs to be executed (more useful for the teams), and don’t need to include everything (more efficient to produce). What have we learned before that we should consider? What do we want to learn this time? These are two great questions to ask yourself when putting together a brief. Too often, campaign lessons are (at best) captured in campaign post-mortems and not applied to future work. Hardcode a field into your briefs to allow teams to understand what has been tried / learned before. Also consider incorporating a field for ‘what you want to learn’, and include a hypothesis, test, and implications. Utilize the brief and marketing technology to get smarter and more effective over time. What Problems Can Voice Help Solve? I have been fascinated by smart speakers and conversational interfaces ever since I spoke to my first Echo. It reminds me of the first time I browsed the web or used a native iPhone app. It feels like a completely new medium, with its own set of strengths, weaknesses, and possibilities. And like any new technology, there is a lot of attention being paid and pixels being typed towards new ideas and bold predictions. To help frame my own thinking and avoid the trap of ‘technology looking for a problem to solve’, I have created a set of use case parameters. These are based on how voice is actually being used by people, rather than starting with technical product specs. So how are people using voice? It is staggering how quickly voice is being adopted, as close to 10% of North American households now own a smart speaker. Drivers for growth include a low-price point, ease of access and usage, strong word-of-mouth, and familiarity with voice search on smartphone—50% of all searches by 2020 will be voice (comScore, 2017). The reasons people want a smart speaker include listening to music, asking questions without typing, listening to news and information, and making it easier to do things (Edison Research, 2017). Most importantly, current owners are largely satisfied as 50% say they use it more now than they did during their first month of ownership, and 63% plan to purchase another (AnswerLab, 2017). So smart speakers are being adopted, owners are pleased, and usage is expected to increase—what types of use cases make the most sense for voice? Let’s start with the most obvious. There are certain situations where it is not possible or practical to use your hands to access a smartphone, such as when you are cooking, driving, or multi-tasking. Voice is a natural channel to help serve people in these environments and situations. Focus on contexts where smartphones are not accessible: 64% of smart speaker owners are interested in having the technology in their car (comScore, 2017). There are certain types of tasks that are typically completed through a mobile app which can be made more convenient through voice, such as converting measurement amounts or playing a specific song. Voice commands can help simplify some complex interactions and take away multiple screens that a mobile app may require for the same function. Focus on specific moments of need: “brands need to find their own raw chicken on the hands moments where they make a task 10X easier via Alexa” (via Econsultancy). There are certain repetitive needs that people regularly encounter which often are part (or become part) of their regular routines, such as checking local news and traffic for commuting. Popular voice applications today include Flash Briefings and real-time content– such as traffic, weather, and news – that people look for to start every day. Focus on recurring daily or weekly needs: 72% of people who own a voice-activated speaker say that their devices are often used as part of their daily routine (Google, 2017). There are many situations where a query or task is very clear and simple to communicate through natural language, such as setting a reminder or adding something to a shopping list. Voice users are frustrated when devices do not understand their queries, so topics that are more nuanced and discussed using various taxonomies do not work as well as conventional queries. Focus on needs that people can easily communicate: 70% of requests to the Google Assistant are expressed in natural language, not typical keywords used for web search (Google, 2017). There are certain types of questions and tasks that do not require much input from people, such as when you are setting a timer or asking for the local weather forecast. Voice interactions do not work well when a user is required to provide more than one data input, such as completing multiple fields in a form. Focus on requiring the minimal amount of input necessary to complete a task: 59% of people who do not own a smart speaker feel that the devices are intrusive and seek too much personal information (Capgemini, 2017). There are certain types of questions or tasks where people are looking for a single answer or action rather than options or details, such as when you are looking for a movie time at a specific theatre. Voice users typically do not expect to spend much time during a single interaction and are not taking down notes from a voice-delivered response. Focus on needs where a ‘single best answer’ is acceptable: 45% of voice-speaker owners report that they do not make purchases through the device because they cannot see product details (comScore, 2017). There are certain situations where an activity or answer might add to a conversation or group setting, such as accessing a trivia game or finding an answer to a question that may resolve a friendly debate. People are hesitant to share potentially embarrassing questions or information in a social setting and may not trust smart speakers with keeping information secure. Focus on use cases that do not require personally-sensitive information: 89% of voice-speaker users agree that they are comfortable talking to a voice assistant when they are alone vs. 47% comfortable in a social setting (Capgemini, 2017). There are certain queries or tasks that are specific to different rooms in a person’s house, such as scheduling a morning alarm in the bedroom and controlling the thermostat in a living room. Voice applications may be designed to the specific needs associated with different rooms, as evidenced by the popularity of recipes being used via smart speakers placed in kitchens. Focus on use cases that may arise in popular speaker locations: 21% of owners of smart speakers have the devices in their kitchen, and 19% have the devices in their master bedroom (Edison Research, 2017). There are certain instances where a person may be interested in accessing a quick and current update, such as when a package will be delivered or when a person is expected to arrive home. Voice is more natural channel to receive an update, rather than browsing for a product or completing a new transaction that involves product photos and credit card payment. Focus on servicing over transactions: 49% of customers would like to interact with smart speakers to check delivery status vs. 35% making a purchase (Capgemini, 2017). There are a number of digital services that people frequently use through multiple access points including browser and mobile app that present new use cases, such as streaming audio, wearable fitness devices, and ride-sharing. Voice applications have gained traction where people have a relationship with an existing digital service, particularly smart home devices and audio content subscriptions. Focus on combining voice with screens and other access points: 65% of owners of smart speakers listen to more music, 28% listen to more news, and 20% listen to more podcasts (Edison Research, 2017). The first step that any organization needs to take when considering digital marketing training is to assess 'the gap' between the current and the desired state. Where do you need to be, and how far are you away from getting there? For marketing departments, this requires a clear understanding of the changes that need to happen (covered in a previous post). It also requires an accurate assessment of the current ‘Digital IQ’ of the marketing team as it relates to these changes. This is where assessment tools come in. There are a number of assessment tools and techniques that can be used to collect this valuable data that are relatively quick and painless way for employees. Selecting and customizing an assessment tool requires an understanding of the learning goals, as well as input from a subject matter expert in digital marketing. The following is an overview of a few different assessment tools that I have used, often in combination with each other, to assess current state Digital IQ (digital marketing questions and topics are included in the examples for illustrative purposes only). The purpose of this tool is to assess how familiar employees are with important terms, tools, tactics, and concepts required to be proficient in digital marketing. This probe is administered anonymously, employees self-report, and results can be tabulated and shared. It is an effective (and non-threatening) way to gather a snapshot of current state employee knowledge. The purpose of this tool is to assess the learning goals that employees have related to digital marketing and to ensure there is alignment with the training goals of the program. The tool can be administered anonymously (or not), and the results can be used to shape curriculum. It is an effective way to enable employees to input into training and for training leaders to flag areas of potential misalignment. The purpose of this tool is to assess an employee’s level of confidence in their own ability across different areas of digital marketing. The survey is administered anonymously and the results can be used to identify topics to potentially focus on. It is also an effective tool for employees to reflect on their own ‘current state’, and it frames the training as a way to build confidence through learning. The purpose of this tool is to assess the level of understanding that employees have relating to different terms, tools, tactics, and concepts. While these tests are often administered after training, they can be used as a way to baseline comprehension and identify gaps. Such tests should be administered anonymously (with results shown individually), to ensure that employees understand that their test scores are not being used for their professional performance evaluations. If you are interested in learning more about assessment, I highly recommend the classic book Classroom Assessment Techniques (Angelo & Cross). My dog-eared copy was given to me by the best teacher I know - my Mom, who also happens to have a Masters degree in Adult Education :-) And if you are interested in conducting a digital marketing training assessment for your organization, I would love to hear from you. The most challenging part of designing digital marketing training is ensuring that the curriculum is up to date with relevant changes in the technology and media landscape. When I was preparing content and exercises for my last Digital Marketing Strategy Bootcamp, the areas that required the most updating related to digital advertising. The tools and tactics available for marketers to reach audiences with even greater precision are increasing exponentially. New products and terminology are also being constantly introduced, which makes planning (or even talking about) digital advertising even more challenging. 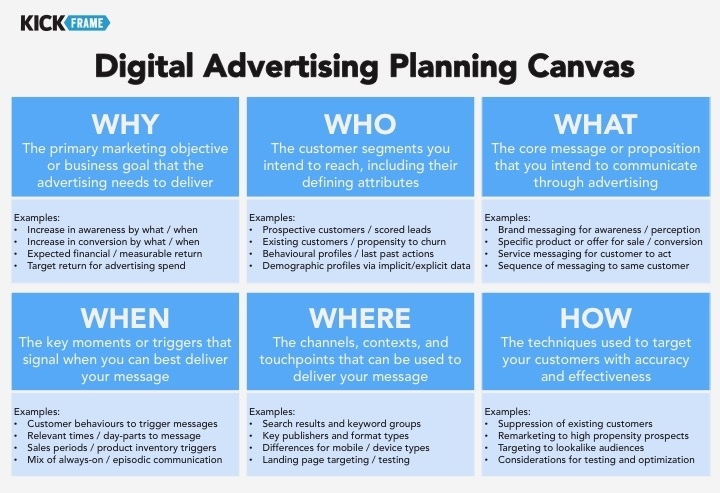 To try and bring some clarity to the topic of digital advertising, I put together a digital advertising planning canvas for Bootcamp participants. It organizes different aspects of digital advertising into core strategic questions that are familiar to marketers when planning a new program. Audience Targeting Opportunities: How can data be used to fuel creativity and relevance in digital messaging? Mobile Engagement Opportunities: How can qualities unique to mobile be used to enhance digital experiences? In-Store Digital Experience Design: How can digital technology be effectively integrated into a physical environment? I find the process of organizing digital marketing tools/tactics into strategic planning frameworks helps move my thinking from ‘what it is’ to ‘what it can do’. Hopefully these canvases can do something for you, too. My favourite part of the Bootcamp is always when I bring in a surprise 'client’ at the end of our session, and participants break into groups to tackle individual briefs. Over the past few years, I have been fortunate to have guest clients attend from established organizations like the TSO, McDonald’s Canada, TIFF, and WWF. This time was different, as we had a pre-launch start-up join us—which made the activity even more interesting. Sameer Hassan is the co-founder of the Shonin Streamcam Security Camera. It is a fascinating new product in an emerging category. The Shonin Streamcam has been covered widely in the technology press, partly due to a very successful Kickstarter campaign. Sameer and team are currently manufacturing the product, with plans to launch in 2018. Developing strategy recommendations for a pre-launch start-up is a different experience than providing recommendations for an established brand—particularly when the start-up founder is in the room. Unlike working on briefs for well-known brands, participants now must consider a product that is new with a marketing strategy that is less defined. Which, it turns out, makes the whole thing a lot more fun. Strategy Discussions in Real-Time. The briefs that participants are tackling are based on the actual problems that the start-up is solving. Sameer is super-smart (trust me, I have worked with him) and has his own marketing plans and hypotheses. That said, he is at a point in time where it is valuable to hear new ideas and different perspectives. During the Bootcamp, there was a really rich discussion around brand positioning that everyone benefited from. Unencumbered Creative Thinking. People can't have informed opinions about a product that does not yet exist. For our Bootcamp exercise, this meant that there was more time required for participants to learn about the Shonin Streamcam, but less time spent trying to figure out how recommendations fit exactly with an existing marketing strategy. This ‘openness’ allowed the teams to develop new ideas for Shonin that may have been constrained otherwise. Unleashing Your Inner Entrepreneur. It is inspiring to spend time with start-up founders like Sameer—their drive and imagination is infectious. I loved seeing how engaged participants were during this activity, and how big and bold their ideas were. Digital media and technology unlock many possibilities for new businesses, and it was fascinating to explore this with the group. I'm going to give some more thought to how I can incorporate start-ups into my training programs. The exchange of ideas between seasoned marketers and start-up founders is really rich, and both benefit from each other. Who knows, maybe my next guest client will be a past participant of my Bootcamp. Hope so. This is the second of a 2-part post on how to add more clarity and drama to your strategy presentations. The first part covered different structures Strategists can use to effectively present the core problem that they are facing, and this second part focuses on how to present the solution. In true Hollywood parlance, consider this post the second act in a two-act structure (not to be confused with a sequel). This structure involves framing your recommendations in a way that overtly supports a clear and overarching business goal. This traditional structure works best for presentations that are focused on solving a specific business problem, with an audience evaluating recommendations based on business returns. Recommendations are driven down from the overall business goal, from strategy to supporting tactics. This structure involves framing your recommendations in a way that supports an overall value proposition. This structure works best for more conceptual presentations, where you may be proposing a new brand / program idea or product / experience design. Recommendations are presented as strategic pillars supporting this overarching proposition, supported by related tactics. This structure involves framing your recommendations within the construct of a journey or path-to-purchase for a customer. This structure works best for marketing or user experience presentations, where the goal is to engage with customers in a way that positively impacts behaviour or brand perception. Recommendations are presented as engagement opportunities that intersect and serve customers at key moments, to the benefit of both the customer and the business. This structure involves framing your recommendations in a sequence of phases that increase in impact over time. This structure works best for presentations that are focused on building capabilities, including technical programs that involve platform maturation and release planning. Recommendations are presented as sets of activities that enable future phases, which deliver increasingly greater sophistication and impact. This structure involves framing recommendations in a way that describes how your solution will change the current state. This structure works best for presentations that are intended to be more emotional, where the Strategist can describe in broad-strokes ‘how we will change’ or ‘where we will go’. From-To statements are thematic, and can set the stage for more specific tactical recommendations (that may be presented in one of the earlier structures). I hope that you have found this particular strategy story useful, and that these structures help you to shave off a few hours the next time you have to design a strategy presentation. If I come across any others during my next 10,000 hours, I will be sure to share. I was catching up with my friend Rob a few weeks ago, and told him how I was helping a number of clients build presentations for strategy recommendations and new business pitches. As Rob and I have known each other and worked together for many years, he told me that I should “call Malcolm Gladwell and let him know that you’ve now reached 10,000 hours of PowerPointing”. I would have thrown my pint at him, if I didn’t need it to drown the fact he was probably right. Over these 10,000 hours, I have come to appreciate the importance of establishing a solid structure for telling (and selling) strategy. A poorly structured presentation weakens your argument, undersells your ideas, and bores your audience. Strategists play a pivotal role in building presentations, as we are typically responsible for providing insight into the problem, framing the core opportunity, and proving why our recommendations are sound. In fact over the past few years, I have spent as much time structuring strategy presentations as I have developing the actual strategy recommendations. So with the hope of shaving off a few thousand hours for other Strategists, I have outlined a few different structures that I have used to build strategy presentations. I will break this topic into two posts: (1) Presenting the Problem, and (2) Presenting the Solution. This structure involves presenting a number of different points of data and pulling them together into an insight that appears fresh, actionable, and inevitable. It fits best for presentations where you have data that ideally the audience has not seen, and you have an audience with enough time and interest to listen to a longer set-up. The drama comes from connecting seemingly disconnected dots. This structure involves setting up an argument for how the audience may be approaching the core question a wrong, or at least in a limited way. It fits best for presentations where you want to be more provocative with the audience, and set up a ‘zig when others zag’ story. The drama comes from challenging convention in a thought-provoking way. This structure (Duarte’s Sparkline) involves contrasting the current state from a future state that is more desirable and possibly attainable for the audience. It fits best for presentations where you have a clear and compelling vision to sell, and sets up a ‘how to get there’ story. The drama comes from tantalizing the audience with the size of the prize. This structure involves illustrating that there is a significant issue on the horizon for the audience that they cannot ignore, and that they may in fact be able to use to their advantage. It fits best for presentations where you need to build a sense of urgency, and can set up an ‘innovate or die’ story. The drama comes from describing danger ahead that can be addressed now. A few years ago, Tom Goodwin (@tomfgoodwin) wrote this in a popular and thought-provoking piece called “The Battle Is For The Customer Interface”. I have returned to it a few times over this past year while helping clients interested in creating greater levels of engagement with their customers. As Mr. Goodwin clearly describes, new digital platforms are being adopted en masse, and traditional businesses (travel, telco, banking, automotive, media) are being left behind as the “dumb pipes”. Taking this concept down to the marketing level, I see a similar challenge. Brands are getting further away from the customers they want to directly engage, and the gap is being filled—and in many cases caused by—new digital platforms. Depending on your organization and industry, different combinations of these forces and seemingly parasitic players are making it increasingly difficult for you to engage customers directly. Your products are their widgets to sell, your content is their assets to publish, and your data is their APIs for new services. Marketers need to determine how to address these challenges in order to be present in the lives of customers in more meaningful ways, through experiences that they can more fully control. One way that I approached this challenge recently was by sketching out a mind-map of engagement points for a brand. What I tried to do was open to open up our aperture and identify out all of the ways that someone might engage with the underlying passion area related to the brand. This way, we could start exploring different tangents and adjacencies that might represent new ways to create connections with customers without being trapped by traditional conventions of the category. For example, airlines are quickly becoming the “dumb pipes” for travel now that people have adopted services such as Expedia, Kayak, and Skyscanner. We can explore new ways for an airline to connect with customers by widening our frame to how people engage in ‘travel’ instead of how people ‘buy flights’. From there, we can research and identify different ways that people engage in the underlying passion area of travel, and review these more abstract points of engagement. Creating such a map can help clarify where a brand is present today, and where new opportunities may lie to create a new connection. Where are those areas where you provide value to customers today? Where are those areas where you are becoming dis-intermediated from your customers the most? Many of the areas in this engagement canvas may be well served by other brands, organizations, and services. In some cases, this may be to your benefit—such as having your news or content being shared by other platforms. The point is not to cover the board like a game of Risk. Ask yourself, are there other areas here where your brand can provide value to this network in a way that no one else can? Considering these spaces where you may want to play a greater role, what can you do? As a travel brand do you want to compete in a new area by launching a new platform (like AirBnB launching a new travel magazine)? Do you want to partner with a complimentary brand to extend your reach (like Starwood SPG members earning points through Uber rides)? Or do you want to extend your existing services to provide even greater value over time (like Air France allowing passengers to finish movies after their flight lands)? By creating your own map, you may find new ways to bridge this widening engagement gap between your brand and your customers. One of the most interesting aspects of putting on my own training events is figuring out how to make them even better. I have the opportunity to reshape everything from the format, curriculum, exercises, venue…right down to the type of chocolate and coffee served (Soma and Balzac’s!) In-class participant feedback is immediate, always useful (and often humbling). Post-event surveys are also a valuable way to get a handle on the overall satisfaction of participants (posted unfiltered here). Something that I did not fully appreciate when I started hosting my own training events is that many participants are interested in attending for the opportunity to meet others in the digital marketing industry. In fact, during my first event a few participants unexpectedly started their own class contact list, which is something that I now regularly provide (CASL-compliant, of course). Given the trend of training programs moving to online platforms, there seems to be an opportunity to help marketers better connect with each other within the classroom and beyond. The biggest challenge in delivering a digital marketing strategy course is not that the space is constantly changing, it is that it is constantly expanding. More technology, tools, and tactics. More opportunities, challenges, and questions. I have developed a framework for the Digital Marketing Strategy Bootcamp that incorporates all of the key facets of modern digital marketing within a 1-day format, but participants are looking for more comprehensive case examples. Given the need for marketers to create increasingly complex integrated marketing programs, its no surprise that there is an opportunity to provide a course that remains broad but goes even deeper. So, it is time to reboot the Digital Marketing Strategy Bootcamp. I have now restructured the course to maintain what people value, while incorporating this valuable feedback (at least that is the goal). The Toronto event will now be held in The Portland Room at The Spoke Club, which will give participants an even greater opportunity to network during group exercises, breaks, and after-class cocktails. The curriculum is also being updated to (1) provide more background material prior to the session, (2) include more integrated marketing planning tools, and (3) demonstrate key strategy points through more in-depth case studies. Our next Toronto event is going to be held on November 2nd , and I am really excited to run this restructured course. The Bootcamp events sell out and seating is limited, so if you are interested reserve soon at the Early Bird rate here. If you have any questions (or have even more ideas on how to improve digital marketing training), please do not hesitate to reach out. I’d love to hear from you.